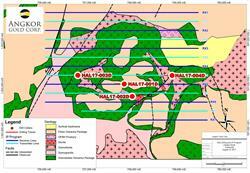 SEXSMITH, AB--(Marketwired - August 17, 2017) - Angkor Gold Corp. (TSX VENTURE: ANK) (OTC PINK: ANKOF) ("Angkor" or "the Company") CEO Mike Weeks is pleased to provide an update on the current diamond drill program at Halo on Angkor's Oyadao South license in conjunction with its exploration partner, Japan Oil, Gas and Metals National Corporation ("JOGMEC"). After reviewing the preliminary data from the ongoing IP program and evaluating core from the initial 813 metres of the planned 1200 metre drill program, Angkor and JOGMEC intend to increase the drill program. Hole HAL17-001D at Halo was drilled to test an airborne magnetic anomaly and was drilled to a depth of 411.9 metres. 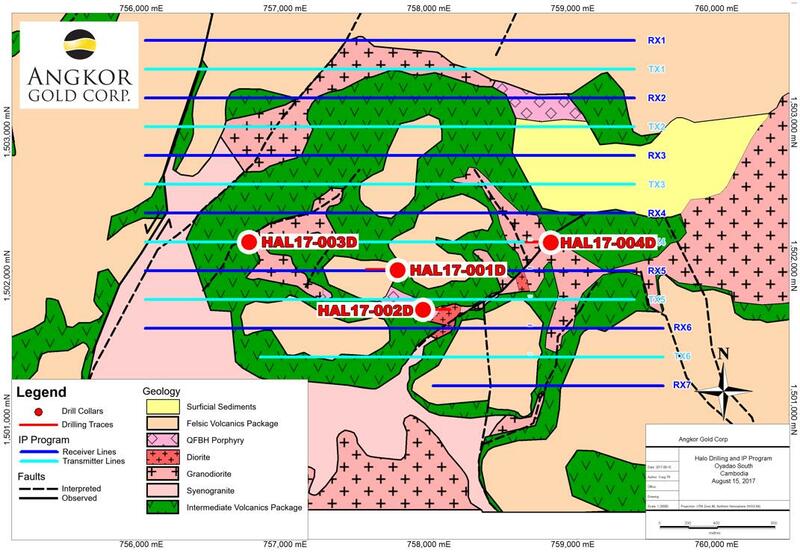 Hole HAL17-002D was drilled to test both a surface copper molybdenum anomaly and a target outlined by the initial IP sections completed before the hole was collared. It was drilled to a depth of 401.21 metres. Field observations show that the porphyry style mineralization and alteration exposed on surface continues to the bottom of the initial two holes. Preparations are being made for planned drill hole HAL17-003D and additional hole HAL17-004D, each with planned depths of 400 meters targeting copper and IP anomalies. All drill holes are located within the area now being covered by the IP program covering the Halo porphyry style system. Angkor has already identified a 7.25 km2 copper anomaly on the property. Drilling is intended to further define and test the structure and mineralization of the anomaly. Field observations of the core indicate that pyrite, molybdenum and copper veinlets and veins exposed on sparse surface exposures continue to the bottom of the first two holes in the targeted intrusive/volcanic rock sequence. Detailed logging of magnetic susceptibility and short wave infrared analysis of the core will help to determine where we are in the porphyry system. The core samples are being logged and split in preparation for assay. "The presence of porphyry style molybdenum and copper mineralized veins is very encouraging," said Dennis Ouellette, Angkor's exploration manager. "The information gathered from this modest geophysical and drill program will allow us to develop high-potential targets for future drill programs." The IP profile is consistent with a porphyry style system consisting of a shallow chargeability high resulting from pyrite/clay alteration draped over a less chargeable potassic alteration zone. Under a Joint Exploration Agreement ("JEA") with Angkor JOGMEC has committed a total investment of US$3 million in exploration the Oyadao South license over a 3 year period. The JEA gives JOGMEC the option to acquire 51% of the Oyadao South license from Angkor.